2017's Baywatch at least sometimes tries to be about saving lives and stopping crime, but this stuff feels secondary to over-the-top gross-out comedy. I truly do not understand this decision to go so far with the high school humor. You could look at the success of the Jump Street movies and say that those were an inspiration, but those movies aren't nearly as lewd as this one is, and they also have a lot of heart and a sweetness about them that goes a long way. Baywatch has no sweetness at all, nor any earnestness either. This movie is the equivalent of a drunken frat boy who thinks he has levels. If Baywatch were a person, that person would be concerned with physical fitness to an extreme, would constantly be making wiener jokes, and wouldn't care about things like, you know..people. If you tried to call this human version of Baywatch out for being superficial and not really having any passion outside of fitness and wieners, Baywatch would look at you and say "Nah, bro! Bro! Bro! Bro! You're fat, bro!" Then Baywatch would say the F-word sixteen times and go work out some more, laughing at wieners as they went. It sounds like I hate this movie, doesn't it? I kind of do, but then I kind of don't. I love Dwayne "The Rock" Johnson so much that I've watched him in a bunch of garbage. The thing is, he always makes the garbage worth watching because he consistently shows up and gives it 110 percent (that's more than 100 percent, bro). This movie is no exception, and Johnson is the reason to watch the thing. I also like some of the supporting cast. Zac Efron has been in several big movies in the last few years and has seems to have transitioned from child actor to Millennial heartthrob, and I think he's just about to the point where he's watchable. He's not great, but he's beginning to be alright and developing a little bit of ability. Alexandra Daddario and Kelly Rohrbach do a decent job as lifeguards who provide the necessary flesh appeal but are able to transcend expectations and actually exist as something close to characters and not just pin-ups. I don't like the casting of Jon Bass as the overweight lifeguard trying to fit in and providing lots of comic relief. You can literally see the studio notes on the script: "Jonah Hill was a fat-but-lovable character in 21 Jump Street, and audiences connected with him. He's the every-man! The lovable fat guy is the audience! Do the Jonah Hill thing in this movie. A fat guy as a lifeguard is HILARIOUS." But it's not hilarious. Neither is the extended scene where the fat guy gets his wiener stuck in something. So many wieners, you guys. I never realized that wieners were comedy gold. Let's play a game where you take a drink every time I write "wiener." I just wrote wiener! Oh, snap! I just wrote it again! Hey, are you okay? You're starting to look sick. Is your wiener okay, bro? Here's the grumpy, middle-aged rant. I'm really tired of studios taking stuff from my generation and the generation before mine and making movies out of them that are totally disrespectful to the original property. Dax Shepard's movie version of CHiPs had nothing to do with the cool show about California motorcycle cops. Starsky and Hutch was not a good movie. Charlie's Angels was not a good movie. Get Smart was not a good movie. The A-Team was not a good movie. And now Baywatch is here, and it's not a good movie. Surprise! Most of what hurts it is that it has very little of the drama and adventure that made the TV show such a big deal. Baywatch from 2017 seems like a Frankenstein monster of other movies and plots, and it ends up being good at none of them. It has a few ocean rescues, it has some interpersonal drama, and it has an overall crime plot, but the stupid wiener jokes (drink!) undercut any real progress the movie makes. It feels like we have to take a break every ten minutes from the "plot" of the movie to make room for a comedy gag that feels out of place. Like I said earlier, you can practically see the studio notes in the script. This does not feel like the work of a director and a writer. This feels like the work of a room full of executives chasing trends that have been marketable in the past but are now worn out. This movie has very little to do with the show that it takes its name and characters from. Baywatch would be a lot more tolerable if it was called something like College Beach Patrol or Lifeguards and I didn't go into the movie having the expectation of a certain tone. Now comes the preachy segment of our show. I have consistently seen people defending this movie by saying things like "it's stupid fun and it's not meant to be taken seriously, so just turn your brain off and relax." Listen, stupid fun is okay. I was raised on Airplane, Three Amigos, and Adam Sandler movies. No one has to defend liking stupid stuff. I just defended the original Baywatch show and kind of defended Walker: Texas Ranger, too. We don't have to take everything seriously, and we are each entitled to enjoy whatever makes us happy. But we should never EVER have to turn our brains off to enjoy something. Look, I get it. The idea behind that statement is essentially "quit nitpicking and just relax." But when I watch something stupid that I enjoy, I know why I enjoy it. I can pinpoint my response, and if I feel like the people behind the movie I'm watching made that movie because they really thought they were having fun, that's always going to translate to a great viewing experience. Baywatch doesn't feel like it was made by people having fun, and I feel like it panders to its audience. The original Baywatch TV show was certainly not Shakespeare, but it did have heart. This movie feels ironic and detached. I believe that Baywatch thinks it's better, cooler, and smarter than I am. I've brought up the Jump Street movies several times, so I'll bring them up again: 21 Jump Street and 22 Jump Street are not high art and they have wiener jokes and frat humor in them, but they also have a lot of heart and try to give the two lead characters some human depth and real emotion. You care about those characters because they're sympathetic, even when they're being ridiculous. The characters of the Jump Street movies invite us in on the fun and welcome us into their circle, and as a result, they feel a lot closer to real people than anyone in Baywatch does. 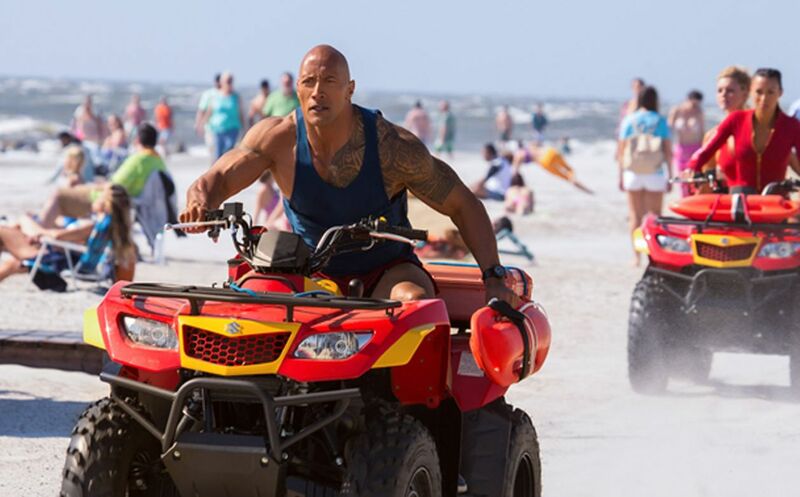 Baywatch is a cynical movie, made with very little care by the producers. By the way, this movie has EIGHTEEN producers, which is the most I can remember on a single movie, at least off the top of my head. You ever see that Adult Swim short "Too Many Cooks?" Yeah, that's part of the problem. Too many cooks in the kitchen pulling the movie in too many different directions. Ultimately this movie feels like it was made by a machine. I suppose, in a way, it was. I think the hard-R approach to this movie was a big mistake. The dirty jokes don't offend me (nothing really offends me except laziness), but they definitely limited this movie from being all that it could be. With a shift in focus, less body humor, and a little bit more action, this could have been something entirely different and significantly better. It's not all bad. This movie succeeds at creating the beach atmosphere (something the show always did amazingly well) and the filming in Savannah, Georgia and Tybee Island add a lot of character that wouldn't have been achieved by shooting in California. 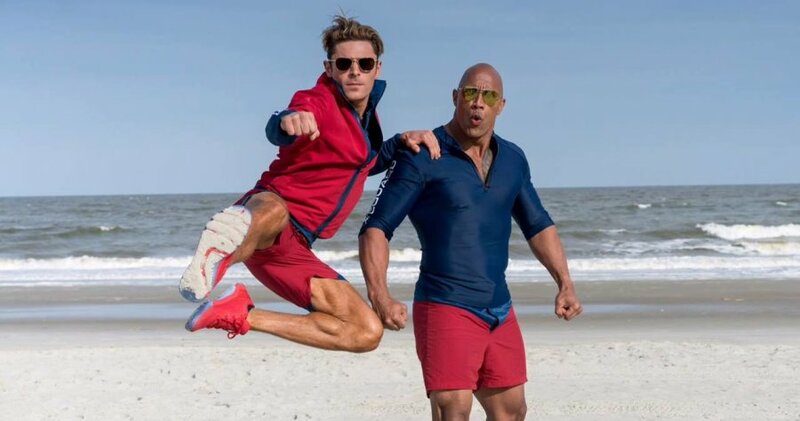 The Rock--I mean Mr. Johnson--does all he can do to make this a hit, and there's even something of a character arc for Zac Efron's role. The pieces are here for a good movie. It's a shame that the writing lets it down. Also, this is a major studio movie (Paramount) that "only" cost 69 million dollars to make. In today's bloated movie marketplace of 300 million dollar flops, 69 million is a middle-to-low budget, which is a good thing. Lower budgets mean more movies and more human fingerprints on those movies...at least in theory. 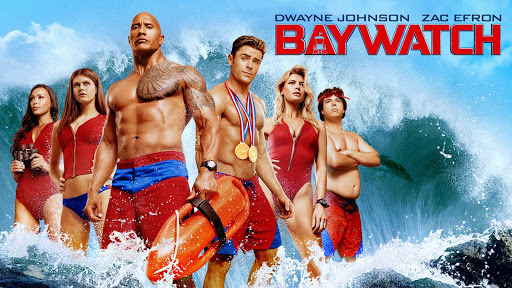 Ultimately, the problems I have with Baywatch are the problems I have with almost everything that is coming out of the broken studio system these days. We live in the era of corporate movie making, when studios hire and fire directors to make the movie that executives have cooked up in a boardroom. When things go really well, we get something awesome like Guardians of the Galaxy Vol 2, a movie that director James Gunn swears Disney gave him full control over. But most of the time, we get movies by committee that feel like they're being pulled in a million different directions and end up serving no one. I'm sad to say that Baywatch is the latter. It's not a disaster; it's just disappointing in the same way that most of the movies coming out these days are disappointing. You can't help but wonder what could have been if there had been a tighter focus, less interference, and if the directors of these movies actually felt a connection to their work instead of being guns-for-hire. I'll definitely watch Baywatch again in the future, but not because it has a compelling story with characters that I care about. No, I'll be watching it for the beaches and the jiggle, because that's the only thing this movie got right.